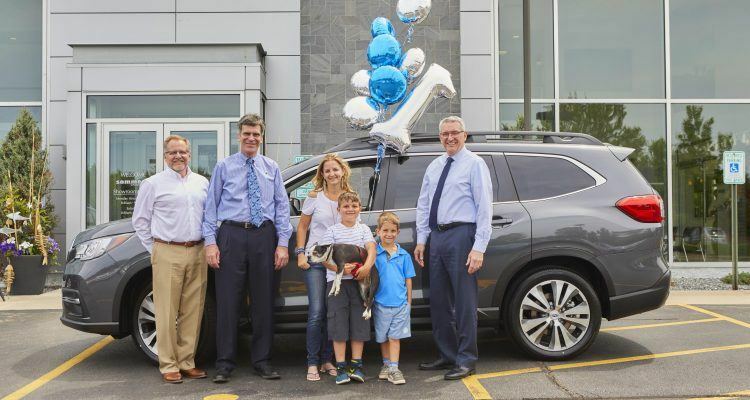 The very first 2019 Subaru Ascent has hit the road, being sold by Sommer’s Subaru in Mequon, Wisconsin to Samantha Ernest of Pewaukee, Wisconsin. To mark the occasion, the retailer held a small celebration for Ernest who was joined by her two sons Caden and Oliver, and their Boston Terrier, Brewer. Production of the three-row SUV began in early May. Subaru of America’s District Sales Manager, Mark Schreiber, was on hand with with dealer principals Don and Wally Sommer. Sommer’s Subaru opened in 1997 and remains a family operation today; Wally’s son, Grant, and Don’s daughter, Elizabeth, are employees. All greeted Ernest personally when she arrived to take delivery. Ernest was presented with the Starlink Entertainment Anywhere kit that includes two 9.7-inch Apple iPads, two Harman Kardon Bluetooth headphones, and two OtterBox cases. The 2019 Ascent is also the first Subaru to have a dedicated, in-vehicle WiFi hotspot. Like many Americans, however, Ernest simply needed more room to accommodate her growing family. 2019 Subaru Ascent. Photo: Subaru of America, Inc.
Subaru’s engineers were tasked with maximizing the vehicle’s available space, creating flexible seating options, and enhancing the overall interior comfort. The 2019 Ascent is now the largest Subaru ever built and comes with a third row, arguably the vehicle’s best feature. 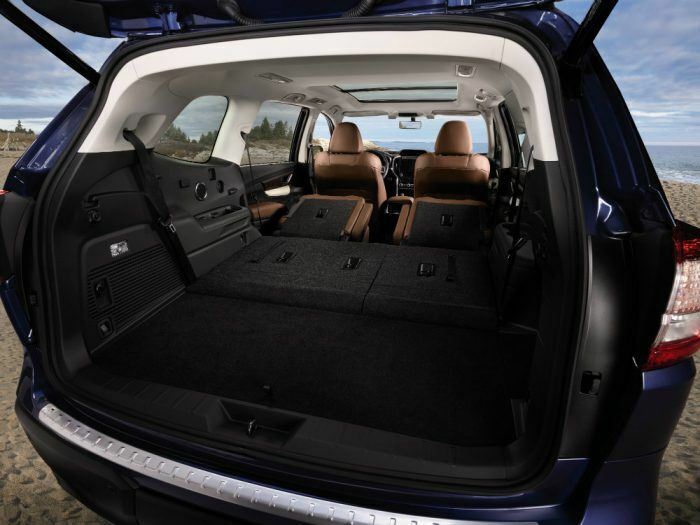 Other family-oriented features include rear doors that open 75 degrees, making access to the third-row seats easier. The vehicle is powered by a 2.4-liter Boxer engine that creates 260 horsepower and 277 lb-ft. of torque. All-wheel drive is standard. 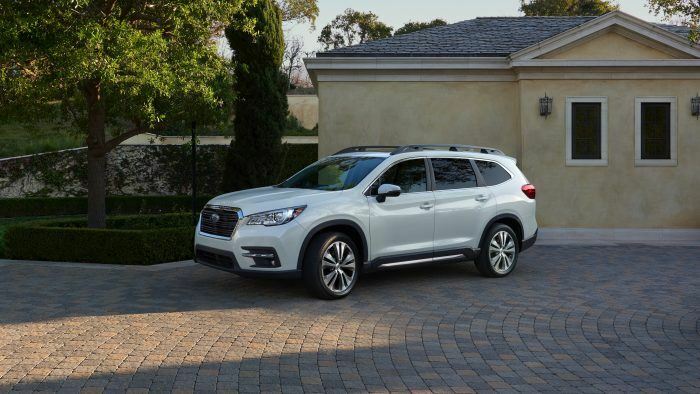 The 2019 Subaru Ascent is priced from $31,995 and is available now in four trim levels: Base, Premium, Limited, and Touring. Subaru’s Lafayette, Indiana plant is responsible for the SUV’s production, which resulted in 200 new jobs and $140 million in equipment and expansion investments. The plant already produces the Outback, Legacy, and Impreza. Photos & Source: Subaru of America, Inc.
No Comments on "First 2019 Subaru Ascent Hits The Road"